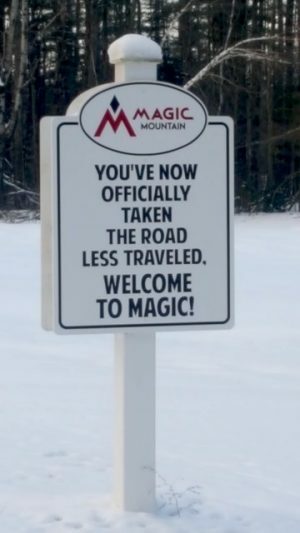 Magic Mt. Has $29 Tickets On Thursdays! Magic is right-sized for seniors and families. We are zipping down Wizard, a 1.6-mile-long intermediate trail that hugs the West Side, in seven inches of new snow with lots of woohoos and yippees. At many areas, this trail would be flattened by now. Not so at Magic Mountain in South Londonderry, Vt.
Groomers will leave the snow to powder hounds until the weekend. They will, however, smooth trails out on the more easy going East Side to keep everyone happy. Natural snow makes some of the East’s most interesting, fun, and challenging trails and glades all the more sweet. Add a trail mainly to yourself midweek, friendly locals, and reasonable prices – Throwback Thursdays lift tickets cost only $29 – and it’s like skiing back in the old days. When Swiss instructor Hans Thorner started Magic in 1960, he picked Glebe Mountain for a reason: exciting, wooded terrain that reminded him of his home in the Alps. Back in the 60s and 70s, Magic Mountain had a huge following. Thorner sold it in 1985. After, the vagaries of skiers, investment, real estate, and weather meant customers drifted away because they could not count on it to be open, and it has had its ups and downs since then. 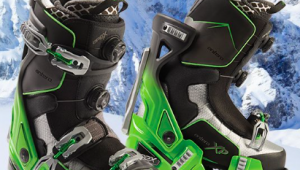 President Geoff Hatheway and his band of 16 investors (Ski Magic) are changing all that. 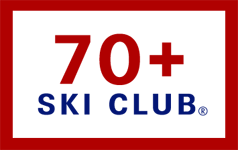 They have launched an ambitious five-year plan to make Magic appeal both to die-hard skiers, families, and the 18- 19– year-old set. The group is investing in snowmaking (now at 60 percent) and lifts. Notably they are putting in new lifts to provide mid-mountain skiing and more lift capacity to the summit. Hatheway typifies the die-hard Magic loyalist. He skied here in 1998 and his kids went through the racing and free skiing programs. Like others he appreciated the family friendly alternative to nearby Stratton Mountain. “Here’s what you won’t find at Magic, a high speed lift and trails groomed Soup to Nuts,” says Hatheway frankly. What you will most like find are other senior buddies either on the lift or in the Black Line Tavern, a popular locals’ watering hole. Throwback Thursdays extend to food and drink specials here, the bands are live, and no one is in a hurry. Magic is open Thursday to Sunday, plus holidays, and on any day it snows 6 inches or more. 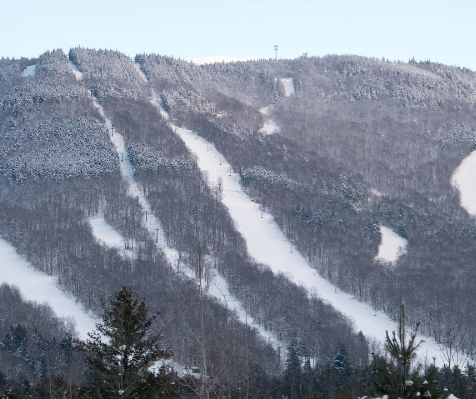 It has a daily sales ticket limit of 1,500 to keep lift line wait times short and glades uncrowded. There it is. An accessible mountain that has something for every senior. Credit: Magic Mt. Had an epic day Nov. 29 at Magic. Great skiers mountain, this and Pico are the best skiing in southern Vt for my liking. Thanks so much for reviving it!!! I was there on November 29th too. Epic!! and empty. I was also there on Jan 20th, about a foot of fresh, but huge lines. They sold out, 1500 tickets max. The good news is that their uphill capacity is so slow (just an old double to the top) that the trails were still empty and still found fresh at end of the day. They are adding a fixed quad to the top this summer, so tripling their capacity to the peak, so powder will be more scarce on weekends. One does not need the Throwback card to ski for $29 on non-powder day Thursdays. It is only $29. BUT, with the Throwback card, one can ski ANY day for $29. There is a difference. This morning I was staring at my Worth Magic Mountain Skis, ya know the purple 107mm wide skis with the Magic mountain trail map on the top surface. 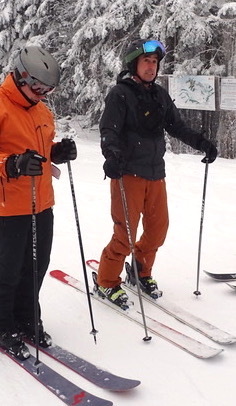 Wishing that I was at Magic skiing freshies instead of skiing in Pa. on crumbs over boilerplate.